The loss of the mirrorbox also means that you lose some bulk. The mirror inside DSLR cameras pushes the lens mount forward from the sensor (the swinging mirror needs clearance). In a typical cropped sensor DSLR (APS-C, DX), that probably adds an inch to the depth of the camera, though there's a great deal of variation between models, so it's impossible to come up with an exact number. Still, a mirrorless camera, all else equal, will typically always be thinner than a DSLR. It also may be less tall if it doesn't have an electronic viewfinder (EVF) to replace the optical one in the DSLR. No mirror potentially means less vibration that might impact slow shutter speeds and promote a slight camera motion to pixels in some conditions. Unfortunately, the shutter itself can impart visible shake at some shutter speeds (early m4/3 cameras were notorious for this; if your mirrorless camera has electronic first curtain shutter, you should use it for shutter speeds <1/250). With some cameras, mostly low end, we also lose some sophistication. The camera makers seem to think most mirrorless cameras are likely to be bought by more entry-level users, and thus while they often have some DSLR-like control in them, this is usually watered down in control capability, flexibility, feature depth, or all of the above. That said, the high-end mirrorless cameras—the Canon R/RP, Panasonic GH5, Olympus E-M1m2, Fujifilm X-T3/X-H1, Nikon Z6/Z7, and Sony A7/A9 come to mind—are pretty much the equivalent of high-level DSLRs though. It's not necessarily a loss, but if you're coming from bigger DSLRs that use CompactFlash cards, the smaller size of most mirrorless cameras means they almost all use the smaller Secure Digital (SD) cards. A few use very small microSD cards, so take a close look at how images are stored if you’re making a transition. A few use XQD cards (Panasonic and Nikon). Autofocus on most mirrorless cameras is now competitive with at least low-end DSLRs, particular for static subjects, but often for moving ones, too. The good news is that, because many use contrast-based autofocus in some form—even the phase detect-based mirrorless cameras tend to do this as a last step when in single servo autofocus—they tend to be better at things like face recognition and precision with static subjects. When these cameras say they're in focus, they're in focus. But be careful. Some of the size advantage of mirrorless is that they use smaller sensors. That’s particularly true of m4/3. Once we get to full frame mirrorless (e.g. 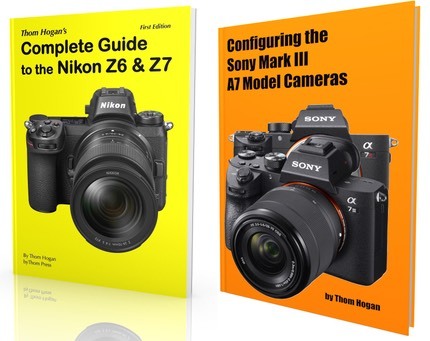 the Sony A7/A9 series), lenses tend to be the same size as equivalent DSLR lenses, and the size/weight advantage begins to disappear, particularly when you pick f/2.8 zooms. Sony is at the other extreme. It appears that they originally pretty much took their APS-C lens designs and did little tweaking to make them smaller. Other than the 16mm f/2.8 lens, almost none of Sony's E-Mount lenses can be considered small for the sensor size, though many of them are fairly light in weight. The FE-Mount for the Sony A7 cameras is more of the same, in spades, particularly when you get to the f/2.8 zooms. Fujifilm APS-C has many choices of smaller lenses.